Quite Obvious. Good looks and pleasing personality - the two important traits that could make anyone shine like a star. When a woman wishes to appear taller immediately, she can wear heels, but, when a man wants to appear taller, he too have an exciting solution in his wardrobe – Elevator Shoes. Unlike women’s high heels, Men's Elevator-shoes also come in variety of styles and designs that are now exclusively available in the market. Men's Elevator Shoes are specially designed as height increasing shoes for those who wants to look taller, immediately, to stand in front of the crowd confidently. These shoes come with thickened insoles that give effective height lift ranging up to 3 to 5 inches, thus helping the wearer look instantly taller. The insoles are further available in three types – rubber, wood and plastic made. One can choose any of the available types, depending upon individual's comfort level. Just like women's high heels, Men's Elevator shoes also offer instant height increase, but with a slight difference that is, women's heels are clearly visible to onlookers, but men’s elevator shoes come with invisible heels. This means no one else than the wearer would know the secret behind the height increase. Therefore, a man will be man, even wearing heels – hidden heels. Next exciting things about these shoes are the comfortable cushioning and elegant design. Top-notch manufacturers of Elevator Shoes understand the desire of a man for an increase in stature without compromising the comfort and looks. 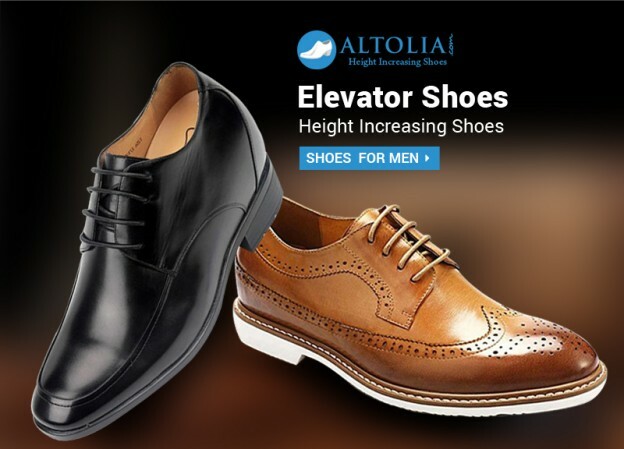 Therefore, the range of high quality Elevator Shoes for Men at Altolia brings a perfect blend of Italian style and comfortable cushioning of insoles with its range of exclusive height increasing footwear. At Altolia, you can find a premium range of high quality leather and super soft insole made height-increasing shoes. Whether you want to outshine in your office meeting or social gathering, our exclusive range of footwear adds an additional charm in your personality with instant height-increase up to 3 to 5 inches and that too without any discomfort.